Of the 532 buildings Frank Lloyd Wright had built during his lifetime, only 17 are listed by the American Institute of Architects as "historically significant." One is a house in west suburban River Forest that is the very first building designed by Wright after he ventured out on his own. Eddie Arruza: He was young, temperamental and extraordinarily talented and this was his debut as an independent architect. Frank Lloyd Wright was 26 years old when he received his first free agent commission and the result was magnificent and historic. Gunny Harboe, architectural historian: He was working for Sullivan and getting some independent commissions, and he was doing that on the side. His agreement with Sullivan said that he was not to do that, of course. He was found out, and Sullivan was not happy about it, and dismissed him from the practice. Arruza: And now for only the fourth time since it was built in 1893, the so-called Winslow House in west suburban River Forest is for sale. It was last sold in 1958 to Bill Walker, a successful TV jingle composer. Walker died in 1994 and his widow, June, stayed in the house until her death last April at the age of 90. Their son, Peter, a Chicago media executive has now decided to sell his childhood home. Peter Walker, Winslow House owner: My mother, who was responsible for the maintenance of the house, basically slaved over it and did a meticulous job of preserving it. Arruza: The commission for the house came from one of Wright's acquaintances, William Winslow. He was the owner of a successful iron works company that supplied the iron for a number of famous Chicago buildings including the Reliance Building and the facade for what would become Carson Pirie Scott. Harboe: He had a relationship with Winslow and that’s why Winslow gave him this job as a very young architect. Arruza: Today, the Winslow House doesn't look exactly as it did when Wright finished it 120 years ago but the basics are still there. From the impressive horizontal Roman brick exterior to the imposing front door with Louis Sullivan inspired ornamentation to a welcoming inglenook and fireplace as you set foot inside the foyer. A colonnade sculpted from beautiful oak shows Louis Sullivan's influence. But a little lower down are hints of the geometric style that would become a signature feature of Frank Lloyd Wright buildings. To the left of the entrance is a library with many of the original elements preserved. But among Walker family mementos that still fill the room is this signature that Bill Walker persisted in getting. Arruza: It's no surprise that the home's present day kitchen is not vintage 1893 but the formal dining room is still largely the Wright design. Extending from the dining room is a semicircular bay with leaded glass windows that form a panorama of the outdoors. But some other features are not Wright's designs. The sconces on the first floor are believed to have been designed and manufactured by Winslow. A painted frieze that surrounds the living room dining room and library was added by the second owner. Something Wright would probably have scoffed at. Harboe: Houses have lives of their own. Their owners all influence what they are, and yes, this house is important because Wright designed it, but it also has a life that has come on over this last 120 years that ought to be respected and thought about as being part of what the story of this house is. Arruza: Even though he was only four years old when the family moved in, Peter Walker says he knew early on he was living in some place special. Walker: The best way I can describe that is even a small child knows the difference between a tiger and a house cat, so playing at other peoples’ houses, you knew they didn’t look like this. But what’s interesting is that my parents never instructed us not to do things. We just knew not to do things. Arruza: As a kid, Peter Walker did experience something that other children definitely don't. Starting around the age of eight his mother gave him permission to open the door when the doorbell inevitably rang. Walker: She’d say, “Answer the door.” She wouldn’t come with me, and I’d make the determination as to whether it was an architect or not. They’d come in, they’d sign the book. And they flew in from all over the world – from Japan, from Germany, from Denmark, from France, from England – everywhere. And then I would walk them around these four rooms that you’ve experienced – these show rooms, as it were, and then out they’d go. Arruza: It’s believed the Winslow House cost between $20,000 to 30,000 to build in 1893. It’s now on the market for $2.4 million. In 1970, the Winslow House was placed on the National Register of Historic Places. 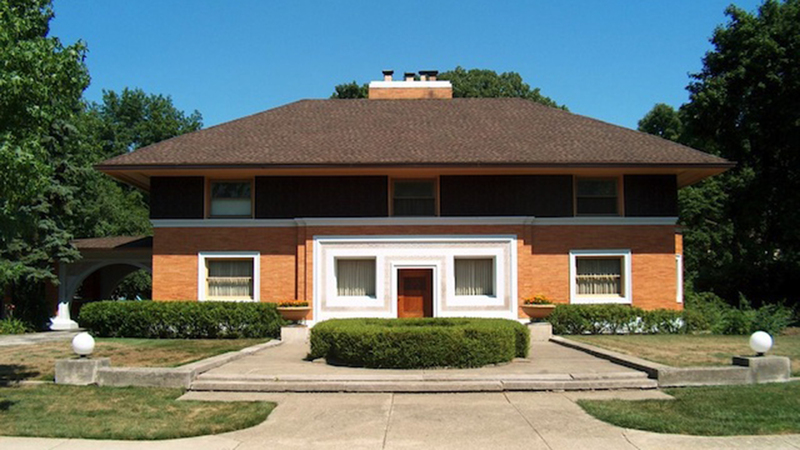 Walker: Many Frank Lloyd Wright homes have restrictions on them as you know, which prohibit certain activities. And there are none on this house. It would be heartbreaking to sell to the wrong person, which I’ll do everything in my power to prevent, and hopefully I won’t even be faced with that kind of situation. We’ve had many wonderful years here, but it’s time for new owners. Arruza: The Winslow House now awaits a sixth owner to, perhaps, carry Frank Lloyd Wright's legacy well into the 21st century.